Dog aren’t vicious animals naturally, typically if they bite someone it’s because they are provoked or if you are doing something they have learned is wrong. 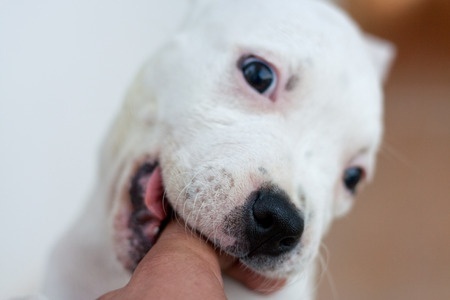 The best way to get your pup to stop biting is to teach them biting isn’t acceptable behavior. This won’t work in every instance but it can help. Your dog will also give you hints when they are about to bite. If we notice these hints you may want to back off and address the situation later instead of getting bit. Some of these clues are hair raised, ears pinned, and even showing of teeth. If you teach your dog it is ok to bite during play they will grow up to think it is ok to do that to other people. Instead of rough housing with your dog play fetch. If you wrestle with your dog you are teaching them it is ok to be rough and bite them for fun. Instead discipline them when they bite you and tech them that is wrong. Pups may also bite if they feel scared. If there was a being two times you size coming at you and you felt afraid what would you do. Either run or attack, some dogs know their bite is powerful and so they will use that to get out of the situation. More dog bites happen to children because children cannot pick up on the cues your dog is giving to leave them alone. Monitor your dog when they are with children to ensure both the child and your pup is safe. Lastly it is important to make sure your dog is properly trained with sit, stay, come, and leave it. The most important command is leave it. This is because if your pet has a favorite toy they are possessive of it is important to teach them to leave it when you say. This may save you and them from a altercation later on down the line. When a dog is possessive of a toy they may want to bite when someone tries to take it away.